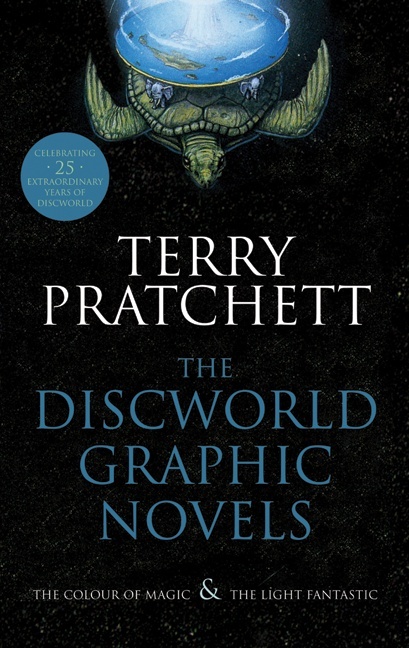 So, I just read the Graphic Novelization of Terry Pratchett’s Discworld series. It was Great. Despite never actually having READ the books (usually a mandatory prerequisite to reading/watching/seeing a remake of something), I thoroughly enjoyed it, and somehow feel as though if I had read the books before I saw this, I wouldn’t have had as much fun, oddly enough. If I had know what was going to come next, it simply would not have been the same. What I am assuming is Terry’s plot has so many twists and turns, I had no idea where it would go next! The quirky humor meshes with a beautiful and detailed art style, and when you add in the great plot line, you have an item guaranteed to enthrall for hours. 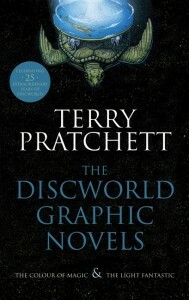 Kudos both to Terry, and to Steven Ross, the illustrator who managed to capture everything perfectly (This may sound like hyperbole, but I am completely serious). Still, This book-like-thing may not be for everyone. It’s pretty lengthly, and quite wordy. So, it’s not for thickheads and those with monosyllabic vocabularies. Everyone else, tho, this is for you! This entry was posted by Patrick	on Wednesday, June 25th, 2008 at 1:20 am and is filed under TPBs/graphic novels. You can follow any responses to this entry through the RSS 2.0 feed. You can leave a response, or trackback from your own site.